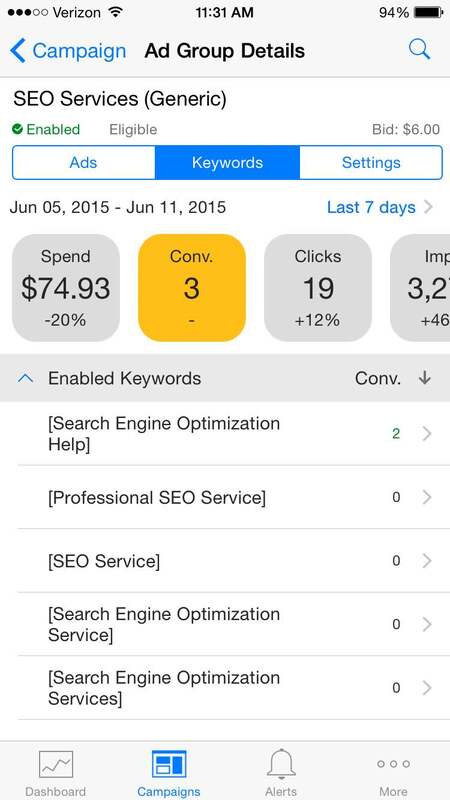 Do you have an iPhone and a Bing Ads account? Did you know you could pair the two together for free? Learn how to use this app today! 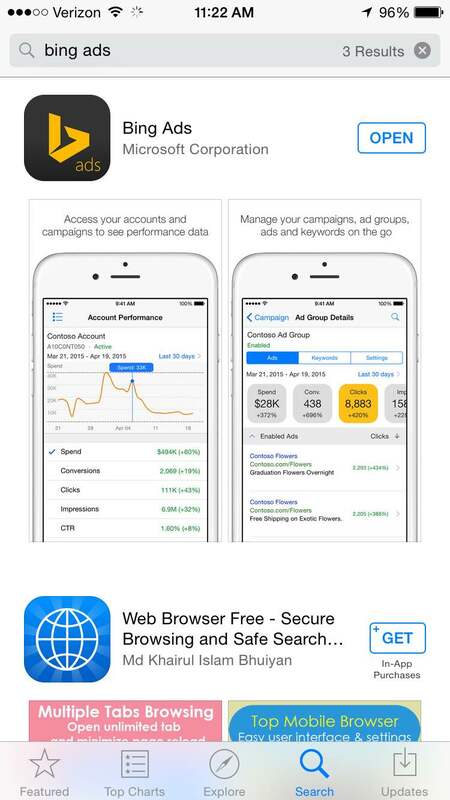 How Do I Download the Bing Ads iOS app for My iPhone? As a note, I already have this app on my iPhone, so it just tells me to open it while I am in the Apple App store searching for it. Here are a few things to look at when you log into your account. 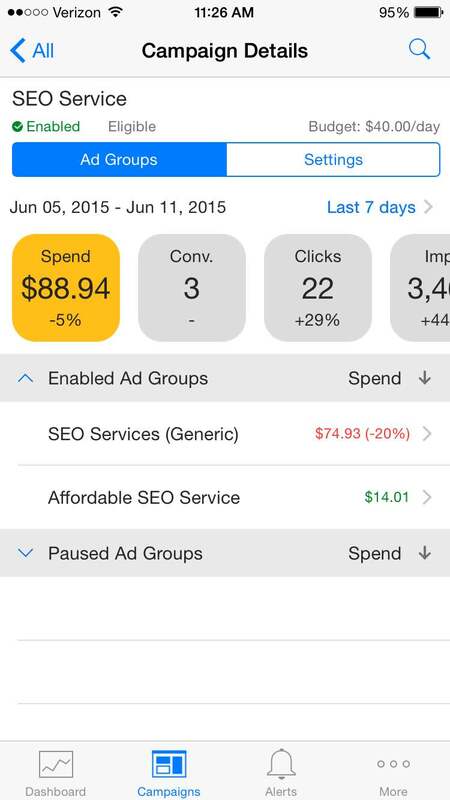 The dashboard is pretty standard if you are familiar with the desktop version of Bing Ads. This is a quick overview of how your account is looking and performing. You can customize the chart whenever you click on one of the rows below the chart. You can also change the date range. In this example, I am just looking at the last 7 days of data and I am looking at the spend. This is where you are going to spend most of your time in my opinion when you use this app. The campaign allows you to drill down to areas that are important for the success of your campaign. You can change the view at a high level to get an idea of your ad spend, the amount of conversions, the clicks, the impressions, the CTR, the average CPC, the CPA, the average position, the conversion rate, and the return on ad spend. Just like in your desktop view, you can drill down to the ad group and the ads. 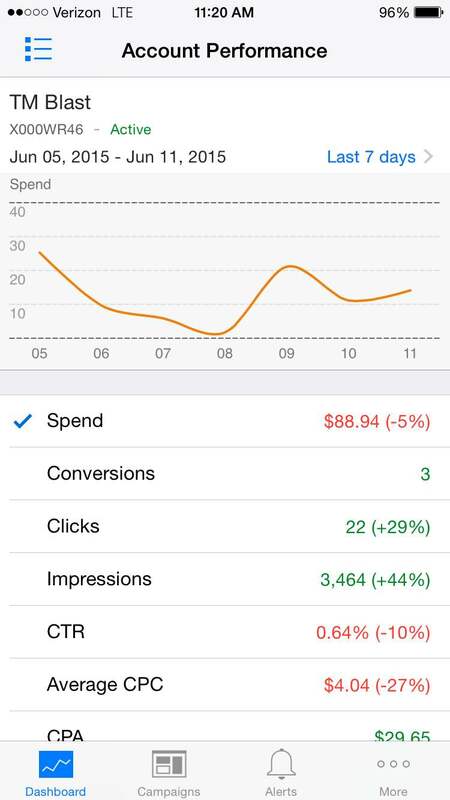 Same as above, you can play around with all of the settings to see very specific metrics on your iPhone. The picture below is just at the CTR for the past 7 days. 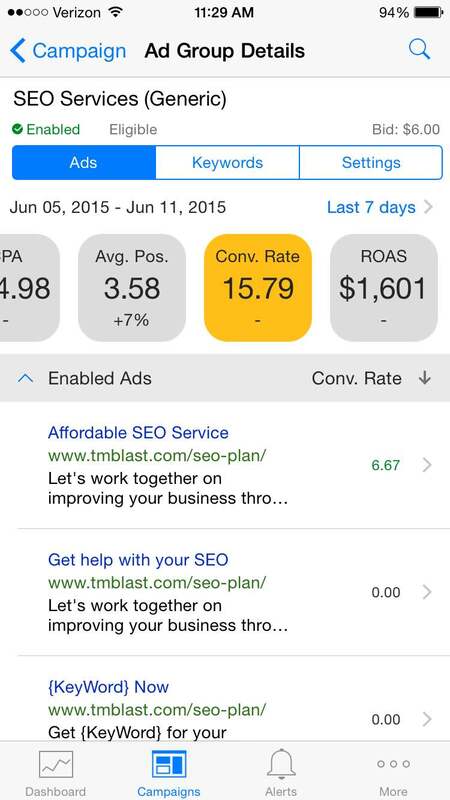 The picture below is just showing the conversion rate. As a side note, you can change the order of the boxes at the top. You can go into more –> settings –> metrics display –> and edit. After you have taken a look at the ads that are driving clicks to your campaign, you want to go to the keywords section. 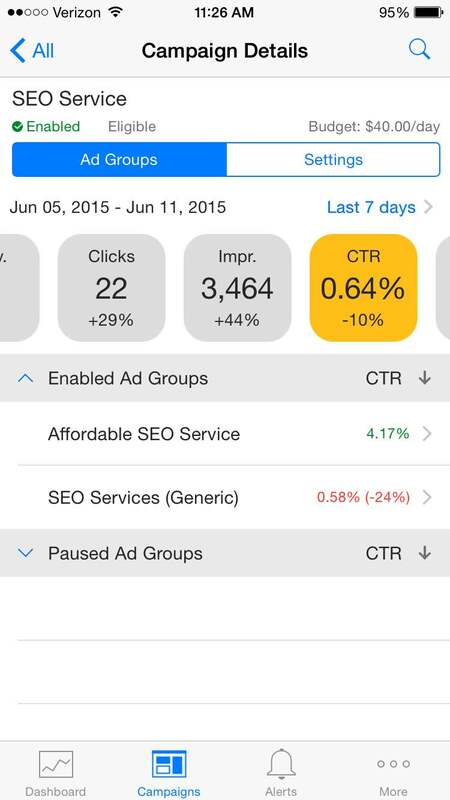 Now, I recently paused some of the keywords to create a brand new ad group, but Bing Ads iOS app allows you to see the enabled and the paused keywords in two different groups. Again, you can play around with the settings for these keywords. Now, I think this is where the app becomes powerful while you are on the go. You can pause any keyword or keywords that are not performing well for your site. You can also change the bid on the go too. Some Areas That Could Improve the app Even More! So I know that this is an app and the purpose of this app is to get a high level view of your account, but I think a few extra things could make it even better. Quality Score Missing. This is missing in the application. If I was going to pause a keyword, I would like to look at a few areas to see if this would be a good decision. While clicks, click through rate, conversions, and more make a large reason to make a change, I would still like to know if my quality score was in fact bad and thus hurting my account as a whole. A quick glance into the quality score is a great high level view of a keyword that is associated to your account. Comparing Time Periods. The app makes a good understanding of how your campaign is performing over a period of time, but I would like to see more of an actual comparison with the previous data like the desktop view. This might become messy, but it would be helpful to compare previous periods over each other while you are on the go. Change the Match Type for the Keyword. 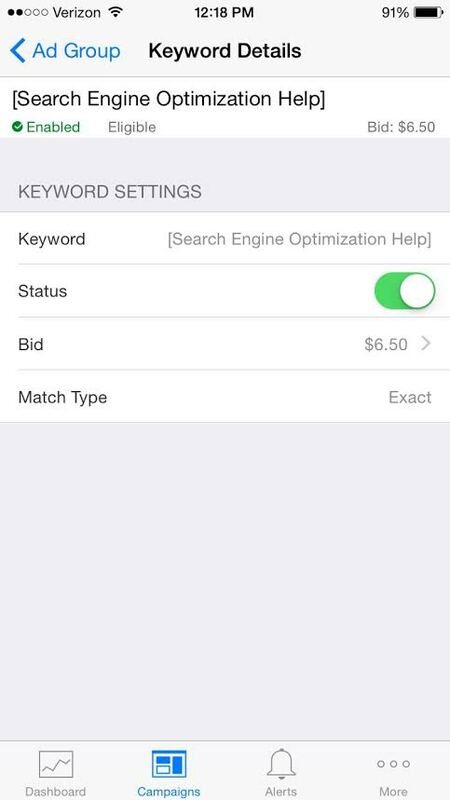 I like how you can change your keyword bid on the go, but I think it would be even better if you could change the match type as well. I say this because you might realize on the go that your broad or phrase keyword is bringing in too much top funnel traffic. If you were not able to change the match type on the fly, I think it would be important to add new keywords on the go with this app. Again, I think most people would be more comfortable making these changes on a desktop, so I am not too concerned if this feature is not added. Most likely, I would make these changes on a desktop as well. Alerts. I think it would be really powerful if the automate section on the desktop transferred over to the iOS app. At this time, you will not see this in the Bing Ads app. However, I did talk to someone from the Bing Ads team about this and they said this may be in the works for the future. This app does exactly what you need it to do. You can get a very high level report while you are on the go that is smooth, fast, and readable. This app I believe will get even more updates over time, so I think people with an iPhone should check this out. You will be pretty impressed with the amount of data you can get while you are on the go!